"It was a technical matter of filing out a form in that case. But they said filling out the form would make them complicit in the provision of the abortion-inducing drugs that they were, as a religious matter, objected to," Kavanaugh said at the Senate hearing. "It’s very clear he’s characterizing their position, which was held by all the Catholic organizations within that set of cases," Department of Justice spokeswoman Kerri Kupec told PolitiFact. The Washington Post fact checker agreed in its own video fact check of Harris' tweet, which gave her "Four Pinocchios," the worst possible rating. "Kavanaugh was simply using the same language that was included in the dissent," the text on the video reads. "There is little indication he thinks birth control is up to date." But the next day, Clinton spread the same claim on Twitter. "He referred to birth-control pills as ‘abortion-inducing drugs.' That set off a lot of alarm bells for me, and it should for you, too," the former senator and secretary of state wrote. 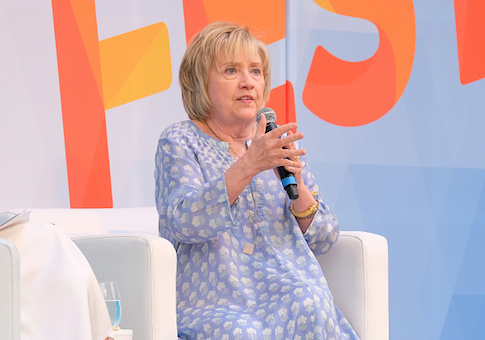 Clinton called it "a dog whistle to the extreme right," and warned that if Kavanaugh was confirmed, birth control would be outlawed. This entry was posted in Politics and tagged Brett Kavanaugh, Hillary Clinton, Kamala Harris, Politifact, Twitter. Bookmark the permalink.